Academy Award® winner Steven Soderbergh directs Warner Bros.' new global thriller “Contagion”. The studio has just released the film's first trailer which you can see after the break. "Contagion" brings together a stellar ensemble cast including Marion Cotillard, Matt Damon, Laurence Fishburne, Jude Law, Gwyneth Paltrow and Kate Winslet. “Contagion” follows the rapid progress of a lethal airborne virus that kills within days. As the fast-moving epidemic grows, the worldwide medical community races to find a cure and control the panic that spreads faster than the virus itself. At the same time, ordinary people struggle to survive in a society coming apart. 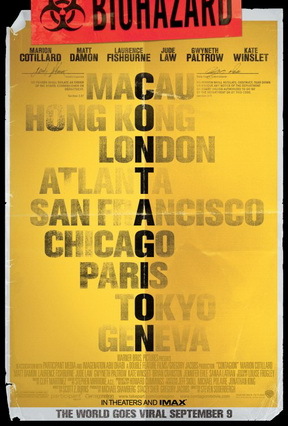 “Contagion” was filmed on locations around the world, including sites in Hong Kong, Macao, Chicago, Atlanta, San Francisco, Abu Dhabi, London and Geneva. Opening across the Philippines in September, “Contagion” is distributed by Warner Bros. Pictures, a Warner Bros. Entertainment company.